Amyloid refers to the abnormal, fibrous, extracellular proteinaceous deposits found in organs such as liver, kidneys, spleen etc. This condition of deposition of amyloid in tissues is known as Amyloidosis. 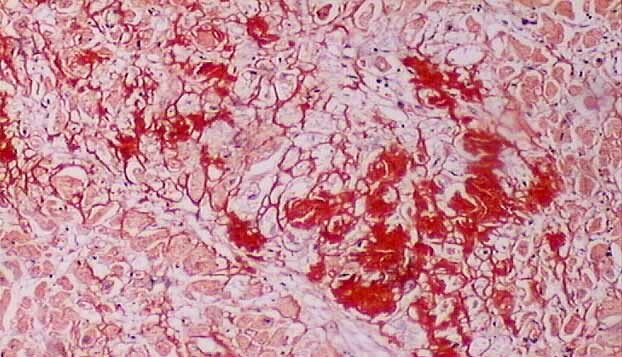 Congo red histological staining technique is the gold standard technique for the diagnosis of amyloidosis. 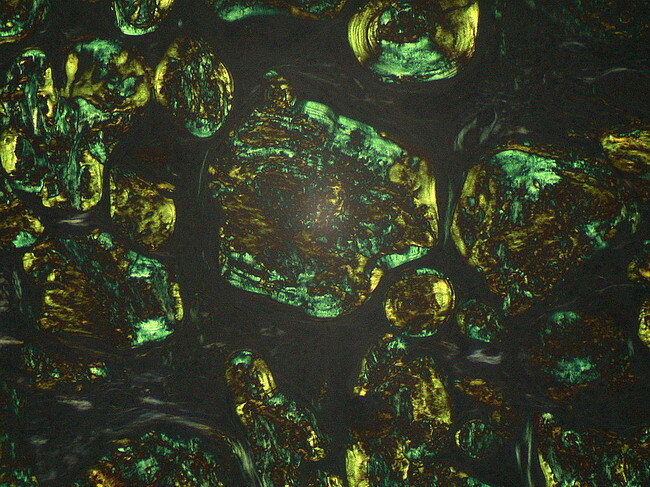 Congo red dye forms nonpolar hydrogen bonds with amyloid and red to apple green birefringence occurs when viewed by polarized light due to alignment of dye molecules on the lineraly arranged amyloid fibrils. The high pH enhances the non-polar hydrogen bonding of congo red and amyloid. Stain in congo red working solution for 10 minutes. Differentiate quickly (9-10 dips) in alkaline alcohol solurion. Counterstain with Meyer’s Hematoxylin for 30 seconds. Dip in ammonia water for 30 seconds until sections turn blue. Rinse in distilled water for 10 minutes.